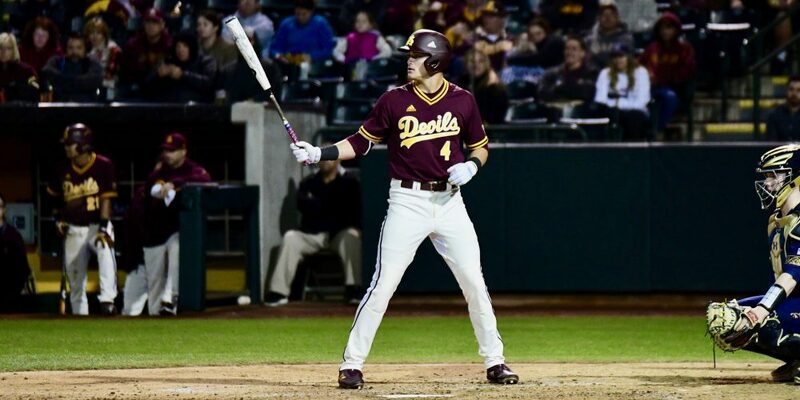 No player in college baseball has made a bigger leap forward from last year to this year than Arizona State junior outfielder Hunter Bishop. Through 19 games, he ranks third in the nation in OPS (1.535), which is more than double the OPS he finished with last year (.759). He’s hitting .438/.549/.986 with 10 home runs in 73 at-bats, matching his career long ball total in 293 at-bats over his first two seasons. He’s 8-for-8 in stolen bases, matching his career total entering the season in that category too. In short, Bishop is a bona fide star for a 19-0 Arizona State club, the nation’s last remaining unbeaten team. And while his rise to stardom has been dramatic, it certainly hasn’t come out of nowhere. He’s tantalized with his enormous raw tools since he set foot on campus; it’s just taken him a little longer to harness those tools because of his multi-sport background and limited baseball experience in high school. Bishop said he didn’t start playing baseball “seriously” until his sophomore year of high school. His first love was football, and he originally committed to play wide receiver for Washington, where his older brother Braden played baseball from 2013-15. Braden, a third-round pick by the Mariners in 2015 who just earned a trip to Japan for the big league team’s season-opener, was supportive of Hunter’s football ambitions, but he also encouraged Hunter to give baseball a chance too.